Just a couple of weeks ago, I outlined the birthday paradox, a well-known counter-intuitive mathematical puzzle. Today, we’re going to explore another quite famous statistical problem, the one with the game show host, three doors, two goats and a car. The problem goes something like this. You’re at a game show on tv. There are three closed doors. Behind two of the doors there is a goat and behind one there is a car. The host of the game show asks you to pick one of the three doors. Once you do, the host opens one of the two unpicked doors, revealing a goat behind it. There are now only 2 unopened doors. The one you picked and another unopened one. Then the host asks you: “Would you like to switch doors, or keep the one you picked first?”. Should you switch doors? Is there any advantage to doing so? This problem is somewhat loosely based on the tv show “Let’s make a deal”, originally presented by Monty Hall. It is very similar to the Three prisoners problem and the Bertrand’s box paradox, substituting goats and a car for prisoners and coins. 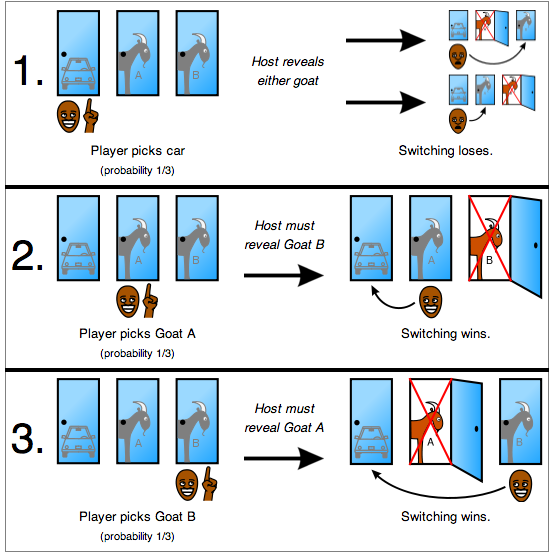 Even though these three problems are very similar, the Monty Hall one is the most famous example, maybe because the game show analogy is easy to understand or maybe because people just like goats better, I know I do (I mean, they all have goatees, what’s not to like?). So, what do you think? Should you switch or not? What is the probability that you will win if you stay and what is the probability that you will win if you switch? Most people’s instinctive answer is that it doesn’t matter if you switch or not. There are two possibilities, hence it’s 50/50 chance. However, you should always switch. Always switch. Allow me to explain. Humans tend to think that the probability of something happening is evenly distributed among the possible outcomes. Therefore, when there are two doors left, we think that the probability is evenly split, 50/50. In a study with 228 partecipants, only 13% decided to switch doors. Like the birthday paradox, our brains are easily fooled. So why should you always switch? The real issue lies with people’s underestimation of the importance of the host: the host knows what’s behind each door. Keep this in mind. There are three doors. If you pick one at random, the probability of picking the car is 1 out of 3 and the probability of picking a goat is 2 out of three. Let’s say you randomly picked the car (but you don’t know that). The host can then open either of the two doors with goats behind them. If you switch you will lose. But say you randomly picked a door with a goat behind it. The probability of that happening is two out of three (since there are two doors with goats behind them). But, and this but is very important, if you pick one of the goat doors the host will be forced to reveal the other door with the goat behind it. Which means that in this case, if you switch, you will win the car. Because the chances of picking a door with a goat is 2 out of 3, you should always switch. The probability of winning if you switch is not 50%, it’s 2/3. The image below gives a visual representation of the problem. As you can see, since two thirds of the time you will pick a goat door at random, switching doors will mean you win two thirds of the time. We can look at this another way. What if there were 10000 doors instead of three. Behind 9999 of them there are goats, and behind 1 there is a car. The contestant picks one at random. The host then opens 9998 doors with goats behind them and leaves only the door the contestant picked and one other. It’s much easier to see that since it’s very very unlikely that you picked the one door out of ten thousand that has a car behind it the first time, it’s much better to switch. Did you get it right the first time? Still unconvinced? Let us know in the comments below! Also, did you know that semantic satiation is the “psychological phenomenon in which repetition causes a word or phrase to temporarily lose meaning for the listener, who then processes the speech as repeated meaningless sounds”. I wrote goat so many times that it has now lost all meaning. Goat. Goooooat. Weird. I can’t think of a single problem that boasts more teaching potential as the Monty Hall Problem. I LOVE this explanation! The problem here is that we are treating it as a maths problem – and ignoring normal human behaviour – especially Loss Aversion (see Daniel Kahneman and Dan Ariely). In scenario one – where I switch and lose I will feel that I “lost” the car (as I had made the right choice). The fact that my chances are better in both scenarios 2 and 3 is little consolation. Therefore – when we still don’t know the outcome we are tempted to stick with our original choice so that we don’t feel the pain of switching and losing. In the situation where we don’t win the car, but didn’t make a “mistake” (i.e. switch) in doing so, we can be more phlegmatic about the outcome. You have been warned – more chance of winning (something you don’t yet have) doesn’t always make you happier! Great post though – and I don’t disagree with the maths – a very elegant way of showing it. Thanks. Yeah, we would rather leave the outcome up to ‘chance’ than making a choice and potentially screwing up. I believe in the problem formulation it is required that the contestant knows beforehand that the host is going to open a door with a goat, rather than just presented with a choice between two doors after a goat was revealed (not knowing the protocol of the host). In the latter case the probability *is* actually 1/2. But as you outline if the contestant is aware that the host must reveal a goat then the conditional probability works out to be 2/3 by switching. You may be interested to know that if the host uses a different protocol then the probability may change yet again. Let’s say the names of the goats are Adam and Bill and you know the host is going to show you Bill with probability p if presented with a choice between Adam and Bill.